Losing a mobile phone is genuinely upsetting. But Wayne Dobson, 59, isn't too empathetic about the plight — especially not after he has found people wandering in his yard, shining a flashlight into his North Las Vegas house and banging on his door at all hours of the day and night, demanding the return of their devices. The poor guy is the victim of a bizarre tech glitch in the Sprint network, which leads users in the area to track their missing handset directly to his home. When it first happened, in 2011, both he and his midnight visitors called the police. "I just said, 'I don't know these people; I don't go where they go.' I'm 59 years old. I don't care about these technology pets they have." It's hard to blame him for being cranky. 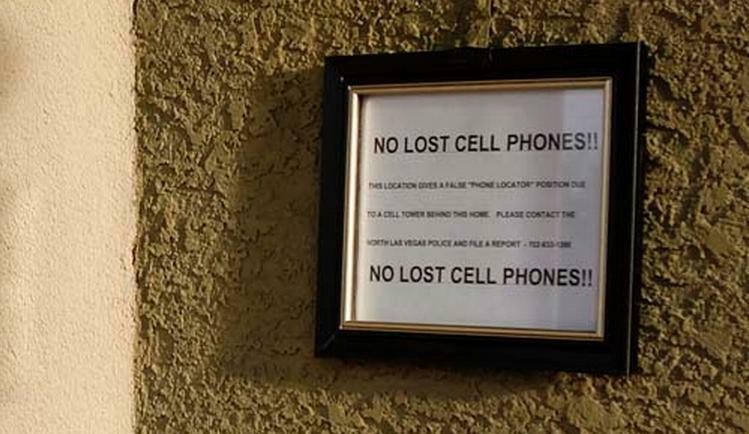 The situation has gotten so bad, he even had to post a sign out front stating that he doesn't have any lost cell phones. Multiple times, people have errantly shown up on his doorstep — including the police. One night, officers mistakenly arrived in response to a domestic disturbance call that actually took place somewhere else. So how did this happen? Well, it's likely a glitch in Sprint's "switchboard," say communications and cellular network experts. Modern devices use both GPS and triangulation, which uses signals from cell towers to estimate a location. It's all part of the same system that allows companies like Apple, Microsoft and others to geo-locate devices, and enables the 911 system to trace callers. (As many as 70 percent of 911 calls are placed by cellphones.) But this type of tracking is only accurate to within 50 to 300 meters, so it doesn't offer precision accuracy — merely a general starting point. And unfortunately for Dobson, the starting point in this area lands smack dab on his house. According to a Sprint representative, the carrier is looking into the matter. Dobson hopes the glitch will be discovered and fixed soon. In the mean time, he sleeps near his front door, so he can quickly deal with inquiries. And he crosses his fingers, hoping an upset cell phone seeker isn't on the other side looking to cause trouble.